As if the taxes and wildfires were not bad enough, here is yet another reason to avoid California. Trapped in his SUV, an ambitious advertising exec asks how the Golden State can have mudslides when there isn’t any water. It is a fair question, but it is obviously rhetorical in William Dickerson’s claustrophobic survival drama, Detour (trailer here), which opens today in New York. Jackson was on his way to a pitch meeting (sort of like that three hour cruise) when the picturesque stretch of coastal highway suddenly turned to mud. Buried underneath who knows how much gunk, he has no cell service and a limited supply of food and water. For temporary distractions (and exposition purposes) he can play videos on his smart phone, allowing viewers to meet his wife. Evidently she is pregnant, but he did not receive the news with spectacular good cheer. As the mud presses in on his vehicle’s structural integrity, Jackson improvises reinforcements. He is actually pretty handy for an ad man. In fact, Dickerson and co-writer Dwight Moody are quite faithful observing the constraints they impose on their hapless protagonist. However, their flashbacks and delusional interludes are nakedly manipulative. 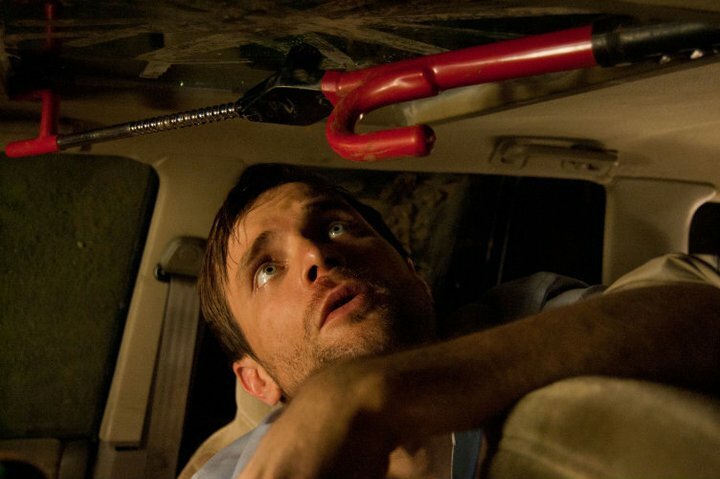 Despite its apparent simplicity, the one-man-against-the-elements genre (in the tradition of 127 Hours) is hard to pull off. Staginess is obviously an inherent pitfall. Still, Neil Hopkins soldiers through reasonably well. While he is forced to mutter to himself quite a bit, he largely sells the messages he leaves on his iPhone, perhaps for posterity. Unfortunately, the sequences outside the mud-trap are flat and awkward. Odder still, it is difficult to tell whether the final scene is meant to be inspiring, ironic, or ambiguous, which is clearly an execution problem. 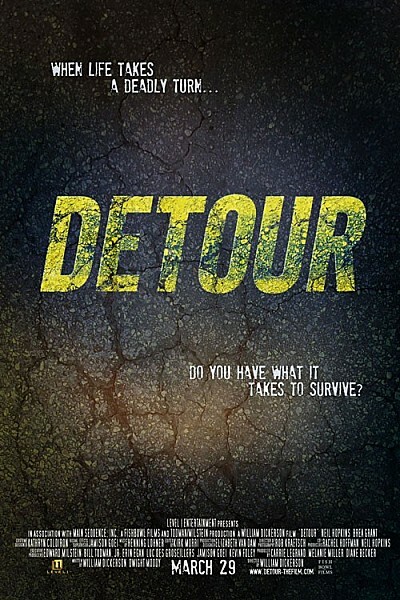 Detour is far from classic, but it is certainly presentable by b-movie standards. Nonetheless, it is tough to justify at full Manhattan ticket prices, particularly with Aftershock, the Eli Roth-penned Chilean disaster smack-down, waiting in the wings. At least worth falling into eventually on cable, Detour opens today (3/29) in New York at the Cinema Village (and is now available on VOD platforms).